Guess what?? Automotive stores are for quilters too. This weeks edition of TTT is an easy one...nothing to sew. All you need to do is go out and buy one or, as usual, steal it from your hubby. For me, I gave it to my husband Scott for all those times when the box says "some assembly required" and there are about 1000 little screws rolling everywhere. Unfortunately for him, he never saw it again after that first day. 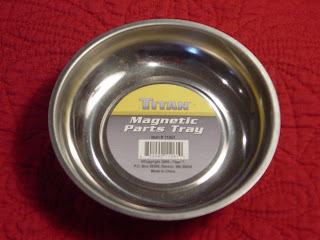 This is a magnetic parts tray or dish. It has a super magnet on the base so it can stick to the car or near the engine when it's being worked on. It will hold small screws and parts so they don't get lost. Well ladies, when was the last time you worked on a car...I don't ever remember seeing a tutorial on how to change the oil on any of our blogs. So check out these pictures below for some quilting/sewing ideas. Isn't she a shining beauty? Plenty big enough for all our goodies! It will also hold all those bobbins that don't have a spool of thread to match anymore:( Poor things. I keep these by my machine. When I'm working on a scrap quilt, I use these half empty ones first. 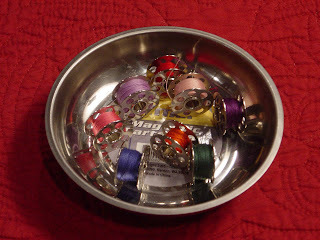 Saves me from having to wind a new bobbin all the time. This will also hold the little bent safety pins for basting. These come bent...I didn't run them over. and how about those super large basting pins. You could have one tray for each kind of pin. There will never be the fear that the pin box will spill over everywhere. I also keep this holder on my ironing board. I had mentioned before, I sometimes use my board for a work surface (it's the perfect height). Well, because the magnet is on the bottom, it sticks to the ironing board and won't fall off. Next weeks edition is from the auto department too, but it involves sewing. I will hopefully get the sample done on Wednesday (in between packing for Disney). I hope it comes out ok...it's all in my head, just need to get it into fabric. I need to get it done before we leave, because I want to use it myself in the car on that very long, long drive to Florida. Ahh...I have piqued your interest for the next TTT...sewing with something from a car store. Hmmm. ps. don't forget to send me your ideas for this magnetic tray and I'll share them on "Friends on Friday". Not sure when I'll get that Friday post up, because we'll be in the car on Friday for 10 hours. Maybe for this week I'll call "Friends When I get Wi Fi". Oh, I like that! Lets see...what else can go in that tray? Great idea. 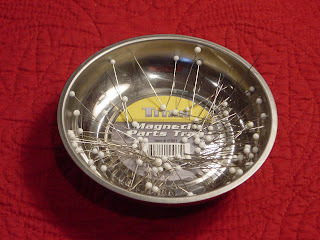 Does a magnetised bobbin interfere with electronic machines? Yay! I actually have one of those. I have had it for about 1.5 years and use it for my pins. I have it sitting on the side of my long arm. It sticks to the machine because it is magnetized. Love this one! This is a true blue testimonial. It's perfect. I am going to Princess Auto and get me one of those. I've never seen anything like it, but it's perfect for the pins that are in need of a space to call home. I guess I need to visit an automotive store - good idea. I was looking for one of these last week in Benny's. I'll need to look again. I could use 4 or 5! Have a wonderful time in Disney!! 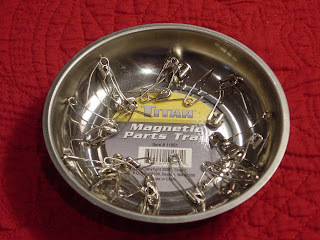 Magnets and pins make sense to me...but magnets and bobbins...now that is genius! I have to go try that. P.S. My heart goes out to the pin that was run over by a crazed sewing machine. Made me smile though. 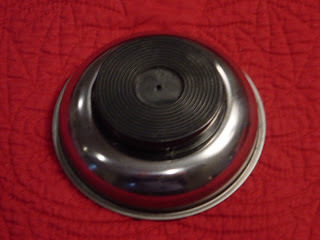 Someone at my last quilt retreat had one of those magnet bowls - it was so useful. AND she had another tool from the auto store I hadn't seen before - another long handled magnet to get all those dropped pins out of the carpet before they get stepped on. It was expandable with a black handle. OOH, I love magnets. I think I'd get one of those metal strips to hang magnets on and then hang the bowl on my wall! Ah yes! Well that's where they are from! I wonder how much Gammill charged me? It came with the purchase of my longarm....now I'm curious to see what prices they are as accessories on some of the sites that sell them for longarming! 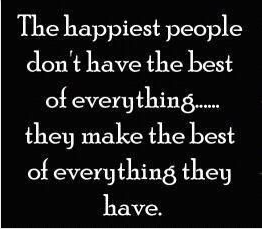 Something to think about.....great to share! Thanks!!! What a great idea! I need some of those! Have fun on your trip to Disney. That will be fun! That's a great idea! I run over my pins all the time. My machine hates me. I have lots of v pins. I keep an old medicine bottle next to the machine to put them all in before I throw them away. More great TTT tips. I have a metal filing cabinet right next to where I sew...the long, table height kind, not the high kind...which I use to place some of my sewing stuff on. Guess what's going to be added? 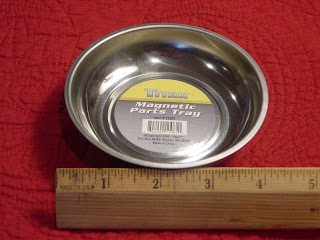 One of your magnetic dishes, of course. No more containers of pins falling over. Super gadget that should be added to all the quilt shop's notion walls. Have a super and safe trip to Paradise...my ex home state. Take lots of photos too! Karen, now that is a neat idea, love it. You need to send it in to the magazine. I have one that rests on the take up pole on my HQ16 and another that attaches itself to some metal drawers under the HQ. They hold pins, needles, tweezers, etc. Great tip. What a great idea ! Happy Easter. Oh my biggest find at the car store is the 1/4" tape they use for detailing I use it for hand quilting! Great idea. I use mine for my pins on the longarm. I just visit your blog for the first time and I love it. Will be back again. Send it to fons and porter and you could get a free magazine subscription! Read your post about this yesterday and last night my father who lives with us was going to Harbor Freight for a sale and I had him pick me up 3! Thanks so much for a great tip! one!!! Love it and the magnet board! 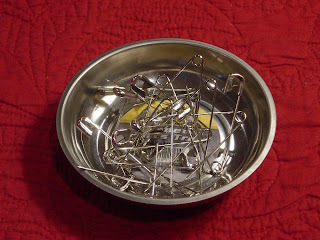 Long Arm Quilting distributers sell these (for more than $1.99 to hold the pins used in basting. Love it. I do these also, cheap and useful and good looking. Anything magnet I love, and a good price. I look at hardware stores for any new use things all the time, love hardware stores almost as much as fabric shops. Want to do it for free?? I used a magnetic business card, courtesy of a realtor, and a candy tin with a hinged lid. I peeled off the business card and found it had enough glue left to adhere to the tin. I love the hinged lid because I can close it up and take it with me without fear of spilling, but the slight magnetic power keeps me from spilling it when it is open. I've had one of these magnetic pin holders for a few years and it's great for NON-COMPUTERIZED sewing machines. But FYI don't use them near a computerized sewing machine. I have heard that the magnets will mess up the computers somehow. I'm just not taking a chance and only use this near my non computerized machine. I didn't see an comments about this so thought I would give others a heads up. Not sure how true this is but don't want to take a chance. I use these too they are more powerful than the Grabbits which I also use. I like these because when I am working at my ironing board with pins it will hold to your ironing board through the cover so then you won't accidentally know the pins onto the floor making a mess. The other thing I like is that they are metal and won't break like the plastic grabbits. I've broken a couple them when they've been dropped. Honestly, they are better and more affordable than the grabbits. I bought a set that had two round ones and a longer rectangular one, which is great for scissors. Love your Tool Time Tuesday! Keep 'em coming. I have been using this for various applications at home and especially, in the garage. Let's say, I made use of this simple, yet, wonderful thing as one of my mechanic's safety tools. Totally awesome!